The eyes have it. Researchers in Australia have been examining eye problems among older horses. Older horses in a recent Australian study were found to have many more eye-related problems than their owners realised. Previous studies suggest that eye diseases are common among older horses, but owners may fail to identify or underestimate their clinical relevance, Fernando Malalana and his colleagues noted in a report published in the Equine Veterinary Journal. The study team set out in the University of Queensland-funded study to document the level of owner‐reported eye disease in horses aged 15 or older, all owned in Queensland by individuals who were members of equestrian associations. 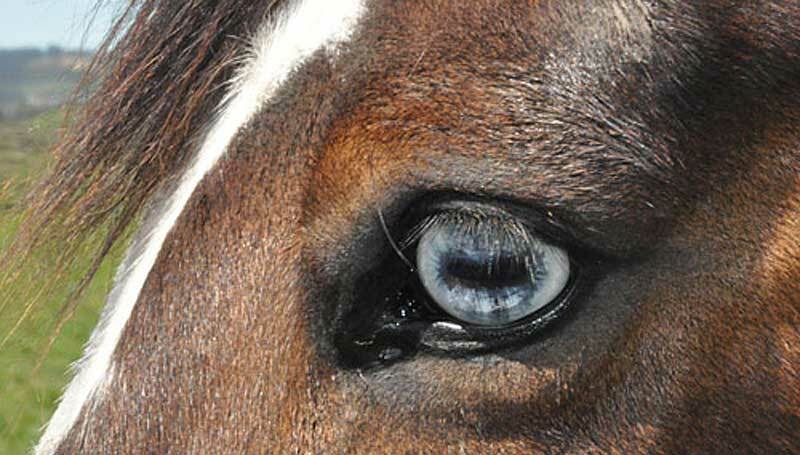 The researchers then examined the eyes of a subset of these horses in southeast Queensland to see how the veterinary findings married up with the owner‐reported reports of eye problems. Eye problems were found to be prevalent, detected in 287 of the 327 horses examined, whereas the presence of eye disease as reported by the horse‐owners was only 3.3%. An owner‐reported history of eye discharge was linked with increased odds of veterinary‐reported diminished vision. Increasing age was also associated with increased odds of the presence of eye abnormalities and cataracts. Appaloosa horses had increased odds of cataracts compared with other breeds, they found. Horses in work were less likely to have an eye abnormality. “This study showed a high prevalence of ocular lesions in aged horses which was not reflected in owner‐reported disease,” the researchers reported. Discussing their findings, the researchers noted that their findings supported those from previous studies in geriatric horses in Britain, which found a prevalence of between 81% and 100% of eye problems. Also, the 3.3% prevalence of owner‐reported eye problems in the Australian study was similar to previous British reports of 1% to 3.5%, an Australian report of 4.2%, and an American report of 7.4%. They stressed that the results of their study applied to a population of aged horses in a specific geographic location, and extrapolating the findings to other populations should be made with caution. They also noted that, despite the high prevalence of eye problems in the study, their effects in terms of vision impairment were small. F. Malalana, T.W. McGowan, J.L. Ireland, G.L. Pinchbeck, C.M. McGowan.